This utility provides the ability to use hot keys in manual trading instantly responding to the current market situation. You can assign hot keys to open/close positions by their type, open/close all positions on the current chart and remove all orders on the current chart. You can also assign hot keys for five predefined trade volumes and switch between them if necessary with no need to change the volume manually from time to time. It is also possible to set the auto calculation of a trade volume in percentage of available funds. 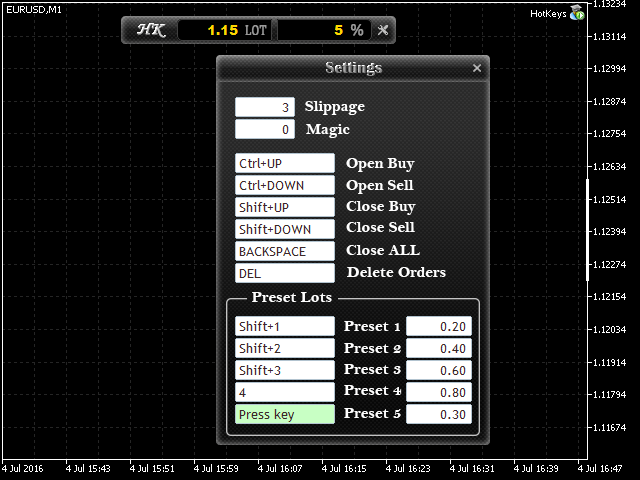 Hot keys - you can assign any hot keys for opening/closing position/positions, except those that are predefined in the terminal. Instant reaction of the program to pressing the "Hot keys". Main window features two input fields. The first one displays the current lot size to be opened when pressing the appropriate hot keys. 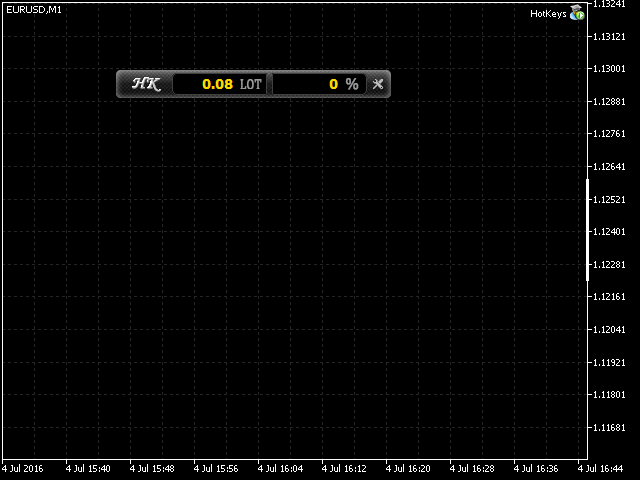 The second one displays the entered percentage of the trading volume auto calculation or zero. In the latter case, a fixed trading volume is used. Settings window allows entering CTRL + any key, SHIFT + any key combinations or single keys. In order to enter the hot key, click the necessary field. "Press Key" message will appear (the program is waiting for the assigned key to be pressed). After pressing the necessary key, click the mouse cursor anywhere on the current chart. In order to remove a combination, click the hot key input field to clear it. Now, click on any empty space of the current chart. Attention: The panel does not work in the strategy tester due to technical limitations! If you need more trading functions, FastTrade utility might interest you. It features hot keys as well.